The truck cruised down Interstate 25 with an empty driver's seat. The human who piloted the truck from Anheuser-Busch to the highway shifted to the back of the cab until the truck exited the highway. The driverless tractor-trailer was sandwiched between four Colorado state patrol cars and three vehicles from Otto. In one patrol car sat the executive director of Colorado's department of transportation, Shailen Bhatt. "This is a big deal. Transportation is being transformed by technology," Bhatt told CNNMoney. "For me, it comes back to this: Technology can help us save lives." "We're eager to begin to scale this," said James Sembrot, senior director of logistics strategy at Anheuser-Busch. "I see a future where this technology becomes ubiquitous, it becomes similar to automatic transmission or cruise control." Otto and Anheuser-Busch did not pinpoint when they see the technology being used regularly and without police convoys. They'll need to receive regulatory approval too. In Colorado, it's a gray area, according to Bhatt. 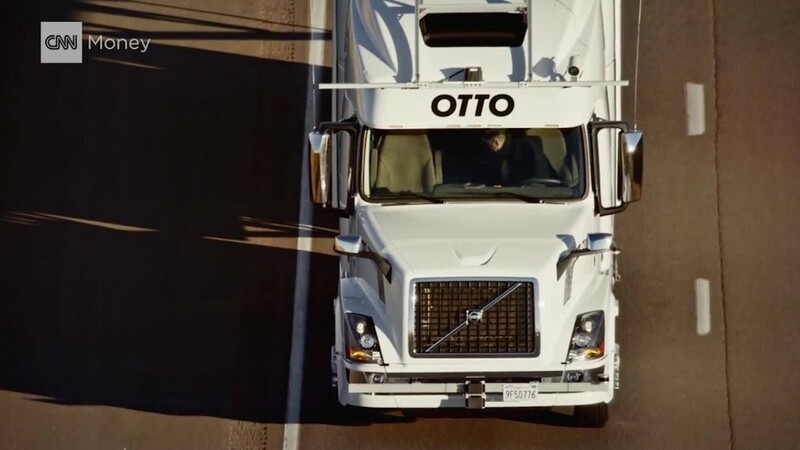 Lior Ron, Otto's cofounder, sees drivers and autonomous trucks working in harmony. The human will become a copilot, taking breaks while the truck drives. Ultimately, Ron said, the truck will be more productive for more hours of the day. "If we work to perfect technology, we can shift a lot of these freight hauls to the dead of night and take advantage of our Interstate system when it's underused," he said. Bhatt said the successful delivery wasn't the only productive part of the trip. Colorado state patrol encountered and apprehended a drunk driver en route.